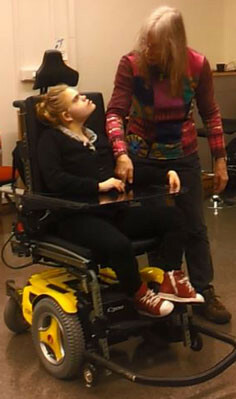 The method Driving to Learn in a powered wheelchair was developed by Lisbeth Nilsson, PhD, Occupational Therapist and Specialist in Occupational Therapy. Practice in a powered wheelchair is a developing and learning occupation for children, youth and adults with cognitive disabilities. Aims are to increase alertness, attention regulation, perception and understanding of different relationships in-between own body, activity, tool use, event, time, place and other people. The method suites practices such as pediatric and medical rehabilitation, special preschools, special schools, day centers for adults and center for multisensory experience. Quotation: Make the impossible possible through facilitating de-plateauing. Powerpoint – Driving to Learn – what develops?